enjoyed these award-winning one-hour weekly radio programs. Advertising executive Sam Abrams had heard Jewish community radio programs in other cities and thought Cleveland should do the same. In 1978, as the chair of Federation's subcommittee on radio, he proposed the idea to Norman Wain, then the chair of Federation's Communications Committee. Norman Wain moved the concept to reality. He formed an advisory committee which included Sam Abrams, Jerry Barach (editor of the Cleveland Jewish News), Norm Friedman, David Guralnik, Belle Likover (of the JCC), Nina Liston, Neil Newman and Peggy Wasserstrom. Then he created a pilot tape and with it was able to secure a grant of $10,000 for the first year from the Federation Endowment Fund. The JCC would administer the programs and the CJN would be a partner in the enterprise. In 1978 Norman Wain was well situated to get the project on the air. A broadcaster himself (he had started as an on-air personality and was now president of a group of stations), he was the chair of Federation's first Communications Committee and a trustee of the Jewish News. (A few years later he would become CJN's president.) Because he was often the MC-announcer at community events and narrator of its audio-video productions, his was probably the best-known voice in Jewish Cleveland. He would be a key advisor throughout the life of the broadcasts. Cleveland native Stu Levin and his wife Carol were selected to be the first producers, and Leslie Gelb was hired as the program's production assistant. Milton Maltz, who then owned two Cleveland radio stations, donated recording time and the services of his engineer for the program tapings. The first broadcast aired on Cleveland's classical music station WCLV-FM on Sunday morning, November 19, 1978.
the first of what would be more than a thousand programs. In May 1979, only six months on the air, the program won its first award: the Twyla Conway Award for Excellence in Public Service Broadcasting, from the Radio-Television Council of Cleveland. Many more awards would follow. On November 9, 1979 a new production team of six was announced with Renee Katz, the JCC Director of Education, as the producer. The women knew each other well. They were all graduates of Mather College and members of Anshe Chesed Fairmount Temple. Many had produced live shows together. The plaque on the table is the show's first award. In January 1981 lexicographer David Guralnik, who had advised on the original concept, began a weekly segment "A yidish vort" (a word of Yiddish). 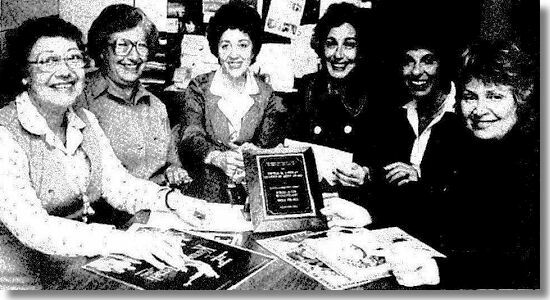 A July 1982 story in the Jewish News tells of a smaller team of four: Renee Katz as producer, with associate producers Iris Fishman, Lois Katovsky and Sue Sicherman. In 1986 production moved to the Mandel JCC in Beachwood, and to modern recording facilities, a gift from the estate of Leo Bernstein. This was a dramatic improvement from their home in the Mayfield JCC, now gone, where they worked in a small room near the Halle Theater, a space sometimes used as a women's dressing room. In December 1989. after heading the production of the broadcasts for ten years, Renee Katz retired. Iris Fishman, Lois Katovsky and Sue Sicherman became the co-producers. The trio would to continue until July 2000, a remarkable 20 years of service for each of them. In 1992 Hebrew teacher Esther Ruben's "A moment of Hebrew" became a weekly feature. The Cleveland Jewish News was an active partner from the start. Every issue (papers would reach subscribers on Fridays) carried an ad promoting the broadcast on Sunday. Each broadcast included an editorial segment by the CJN editor: Jerry Barach for the first two years and Cynthia Dettelbach from 1980 to 2000. The 55-minute shows brought Jewish culture, news, commentary, humor and more to listeners in Northeast Ohio. Each week a local rabbi would provide a brief lesson on the week's Torah portion. Each broadcast opened and closed with a message from Norman Wain. Music, from the synagogue, from Israel and elsewhere, was a major element of each broadcast. WCLV recording engineer Jim Murphy played a key role in achieving a skillful blending of voice and music. Over the course of a year the voices of hundreds would be heard: rabbis and cantors, educators, activists and artists, political and community leaders, agency and Federation executives, and others. Most were Clevelanders, but many would also be heard from around the nation, from Israel and elsewhere. Holiday programs were special productions. Cassette tapes and CDs of several Jewish holiday broadcasts, Mothers Day and Fathers Day were available for sale at the JCC. In the 1990s the Mt. Sinai Medical Center supported the programs. Each week's broadcast included a segment on health care, generally featuring a Mt. Sinai physician. The weekly ads in the CJN would now read "Under the auspices of the Jewish Community Federation, the Jewish Community Center, the Cleveland Jewish News and the Mt. Sinai Medical Center." 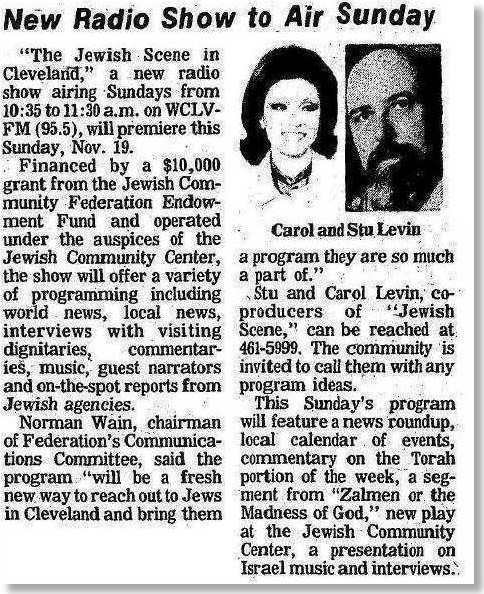 The Cleveland Jewish community, through its Federation and its Endowment Fund, gave the broadcasts the financial support they needed. In turn, the programs publicized the fundraising and program initiatives of the Federation. The weekly programs drew from the community and gave back as well. In July 2000, after a long, successful, uninterrupted run, with as many as 60,000 listeners, and many awards, the broadcasts came to an abrupt end. In a surprising (and to many, inexplicable) turn of events, the Jewish Community Center let a new staff member set a new course for its radio productions. 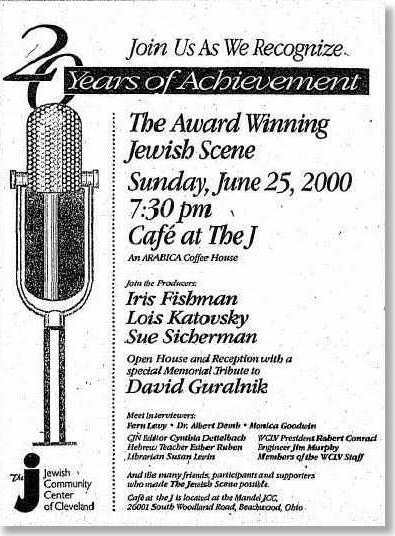 The last Jewish Scene program aired on July 2, 2000. A week before the final broadcast, an open house and reception at the Jewish Community Center celebrated the 20 years of service of the three producers. (The series had actually run for 21 years and 5 months.) Three frequent interviewers, Fern Levy, Dr. Albert Demb and Monica Goodwin, were also recognized, as were Librarian Susan Levin and engineer Jim Murphy. David Guralnik, whose weekly "a yidish vort" was a highlight of the show and who had died the month before, was remembered. Robert Conrad, president of WCLV, which had carried every program, was there too. Norman Wain was not in town, but his message (very appropriately recorded on a cassette tape) was heard. The ad for the June 25, 2000 pre-closing open house and reception. Almost all this information was gathered from old Cleveland Jewish News stories. Without their new searchable online Archive, this page could not have been created. Now what? A webkeeper's thoughts. The broadcasts have been preserved. That is the WRHS archive's objective for audio-visual collections. Unfortunately few people know about them. This page may be their only web presence. 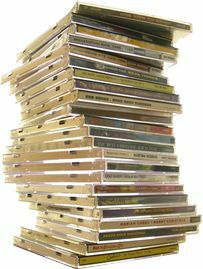 At the WRHS Research Library you will soon learn that they are upstairs in ten boxes of about 100 CDs each. There is no index, no way to search for selections (about 12 on each CD), and no way to listen to them. Let's say you are looking for audio by a rabbi who was here from 1990 - 1994. The CDs for those broadcasts might be stored in three boxes that once each held ten reams of copy paper. They would be brought down to you. Then you pick up each of the roughly 300 CDs, read its label and set the one or two you want aside. Good news! Many issues of the Cleveland Jewish News carried a small ad describing what would be on the broadcast that Sunday. So use the CJN Digital Archive and search on the rabbi's name. But the bad news is that these ads didn't run each week and that many ads mentioned only the main features of the broadcast. There are many ways to improve retrieval. Low tech: copy the labels on the back of each CD's crystal case for they list all the selections on the CD. Put the copies, oldest first, in ring binders or bound books. Mid tech: a) type the content of the labels in a Word or Excel file, assure that they are in date order, and convert it to a searchable .pdf document or b) scan each label to a pdf document, then edit the document to be sure the pages are in date order, then make the document searchable using advanced pdf editing software. High-tech begins with the fact that the contents of these 1,000 + CDs could, if converted to .mp3 format, fit on an external disk drive that costs less than $100. A practical consideration is that each broadcast included a few bands of copyrighted material whose reproduction and publication could present legal issues. Did you know (and only a few do) that before the Jewish Scene closed its doors they made 16 CDs of selections? You'll find titles such as Rosh Hashanah, Yom Kippur, Purim, Humor, Mothers Day and more. Where are they? Full sets were distributed to many libraries in the area and to the larger facilities for elderly Jews. The libraries at Anshe Chesed Fairmount Temple and The Temple - Tifereth Israel have them.